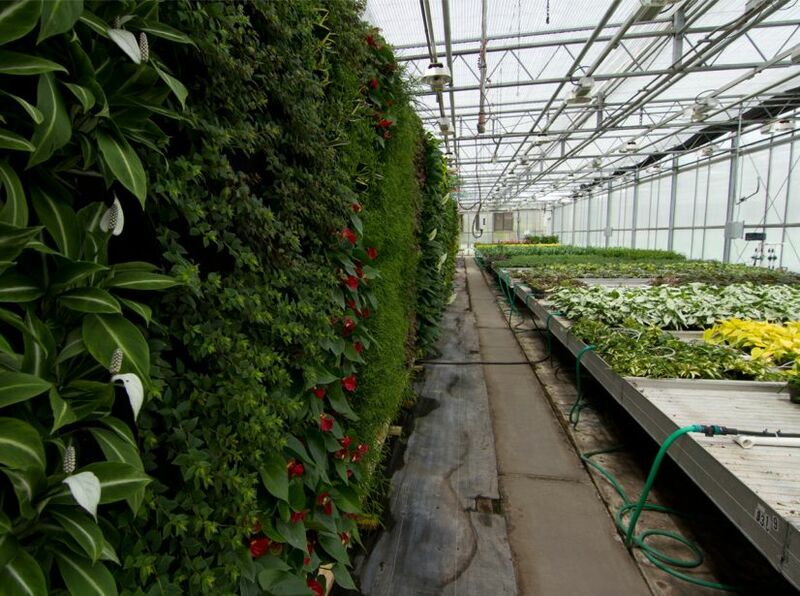 Rutgers University NJ Institute for Food, Nutrition, and Health Living Wall website and specifically the Building Information page; 848.932.3500. For more information about the Rutgers University Institute for Food Nutrition and Health Living Wall, contact Michael Coraggio of EcoWalls, LLC at: 877.219.0988, [email protected], or visit www.greenecowalls.com. 2:29 Rutgers University NJ Institute for Food, Nutrition, & Health Living Wall – Project of the Week 3/28/16 video from Greenroofs.com on the greenroofsTV channel on YouTube; 2:42 general video about IFNH; 1:47 video about the IFNH Living Wall; and 2:44 Living Wall Installation Timelapse all by the New Jersey Institute for Food, Nutrition, and Health at Rutgers University. 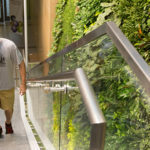 August 14, 2015 Rutgers alumni naturally bring walls to life by Cheryl Makin in MyCentralJersey.com; April 30, 2015 Rutgers EcoComplex showcases largest living wall to be installed in N.J. by Cristina Rojas in NJ.com. 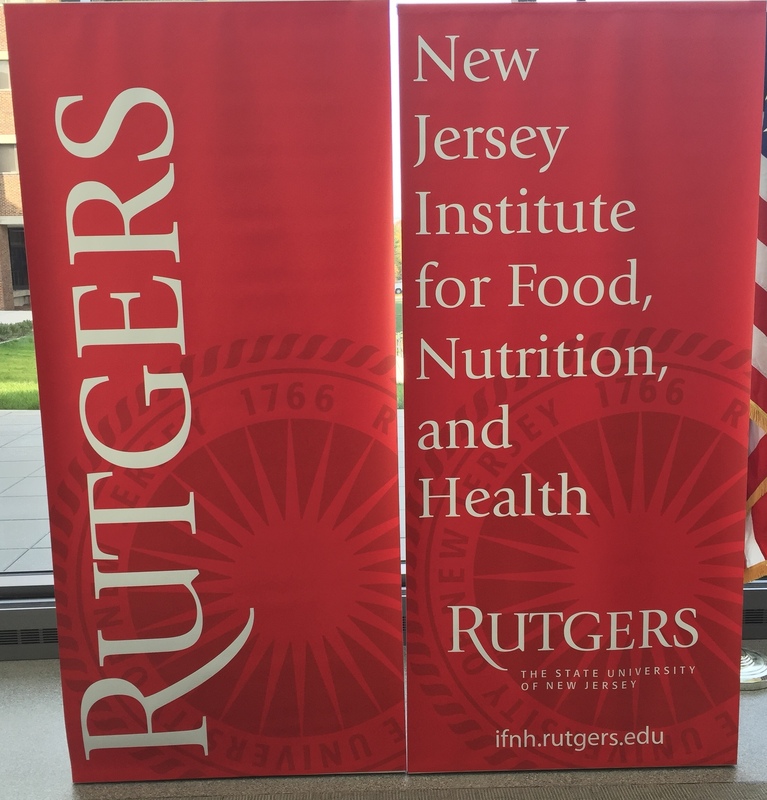 According to their website, “The New Jersey Institute for Food, Nutrition, and Health (IFNH) underscores the commitment of Rutgers University to new transformational initiatives across the many disciplines impacting food, nutrition, and health. The IFNH draws on the strengths of the entire university as it physically co-locates and strategically aligns the diverse competencies and deep capacity of Rutgers to address society’s major unmet health problems. In this complex world, the institute embraces a culture of interdisciplinarity that seeks solutions to our health problems in the social as well as the biological determinants of health,” (see below). 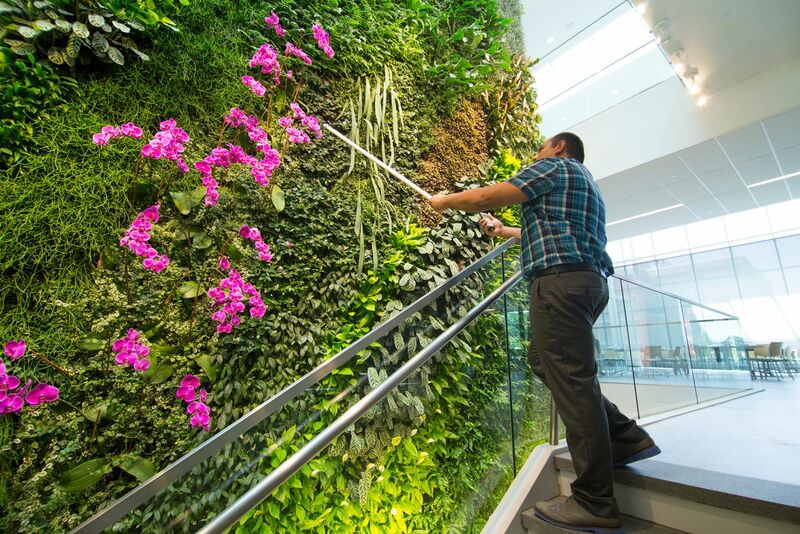 The IFNH building is also home to the largest interior living wall in New Jersey with 46 species and over 5,200 plants covering 1,320 square feet of wall space. 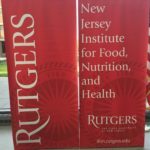 Completed in mid 2015, the new $55 million New Jersey Institute for Food, Nutrition & Health is the newest academic building to call Rutgers University home. 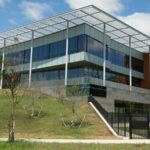 Located on the George H. Cook Campus in New Brunswick, NJ, the Institute is an organizational hub for interdisciplinary research with the primary goal of preventing childhood obesity and reducing the risk of chronic adult diseases. Amongst the 80,000 sq. 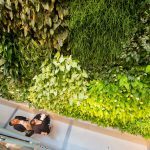 ft. building’s expansive glass façades and many collaborative spaces resides NJ’s largest interior living wall which recently received a 2016 Landscape Architectural Merit Award: Planting Design from NJASLA. 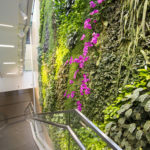 The living wall, adorned with roughly 5,000 low-light tropical plants of 46 varieties, spans the three floors of the building and measures 40’ high and 33’ long. 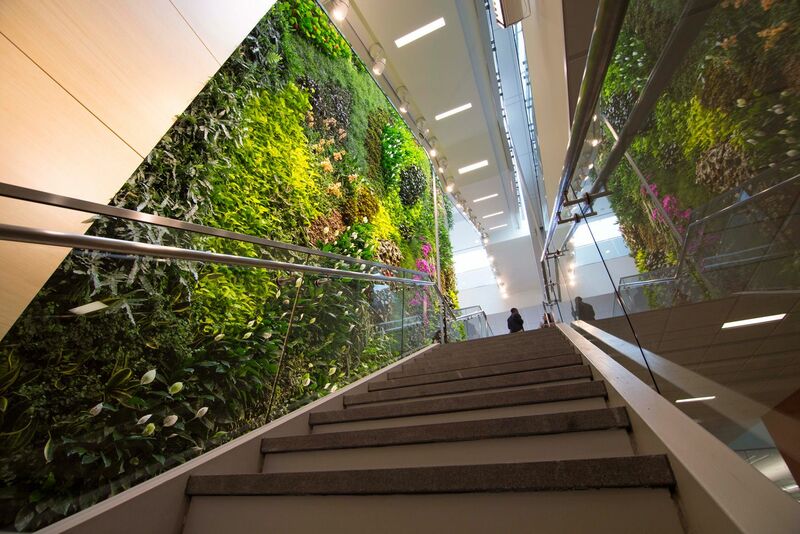 Located in the central corridor of the building, the living wall is a breathtaking backdrop for all who travel the floating stairway between levels. 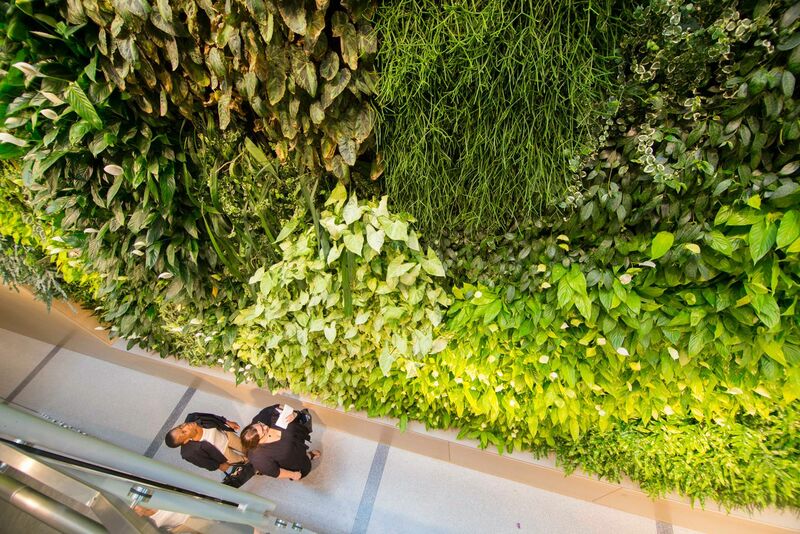 The design intent of the living wall was to promote health and wellness by connecting the building’s inhabitants with nature in an unexpected way. 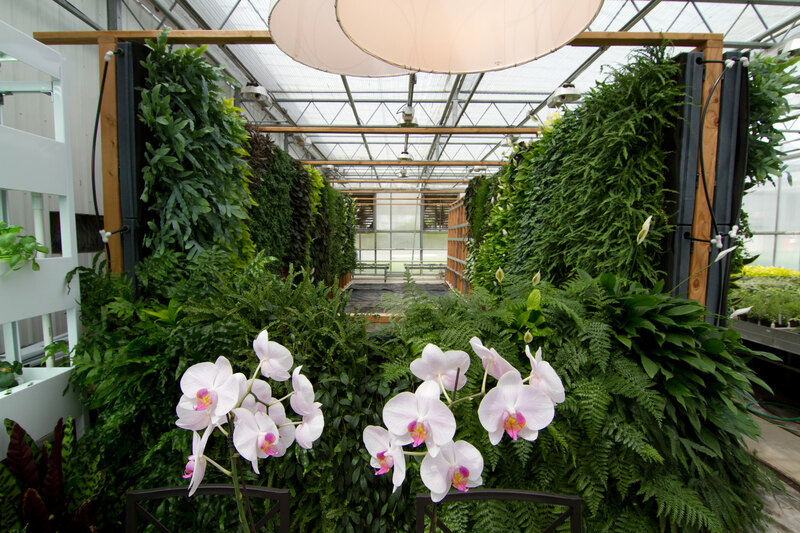 The client wanted to create a space that was soothing and reflective while maintaining their mission and exploiting the holistic benefits of living plants to improve the aesthetic and overall biologic nature of the built environment. 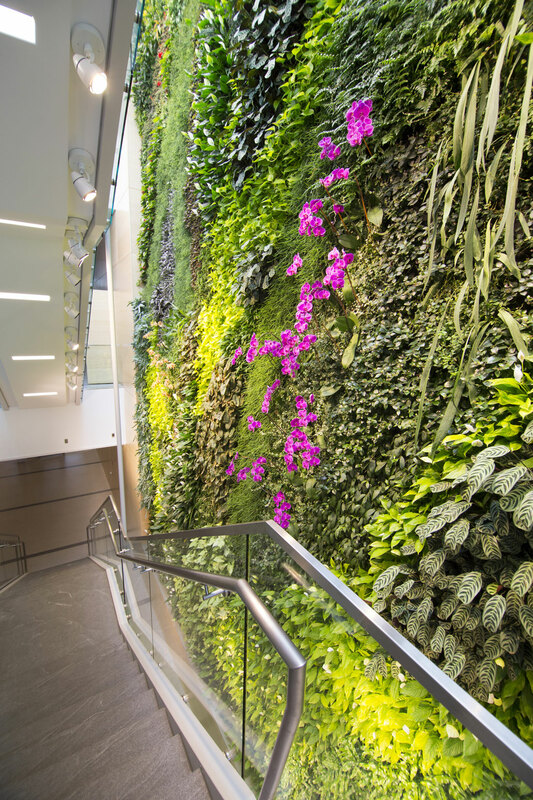 The living wall was intended to be an interactive feature of the building, becoming a teaching tool and destination for multiple courses on campus. 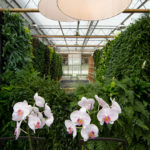 The installation was also meant to push the boundaries of plant diversity and foster a vertical landscape that would showcase healthy and mature plant material over the longevity of the project. 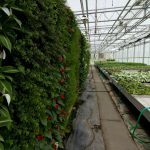 EcoWalls LLC, a leading US-based company focused on providing functional and sustainable solutions for vertical landscapes throughout the world, was the lead design consultant and manufacturer for the IFNH Living Wall. 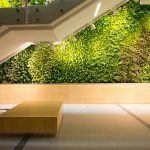 The EcoWall Living Wall System, a modular hydroponic vertical planting panel, is the building block which created the 1320 sq. ft living wall. 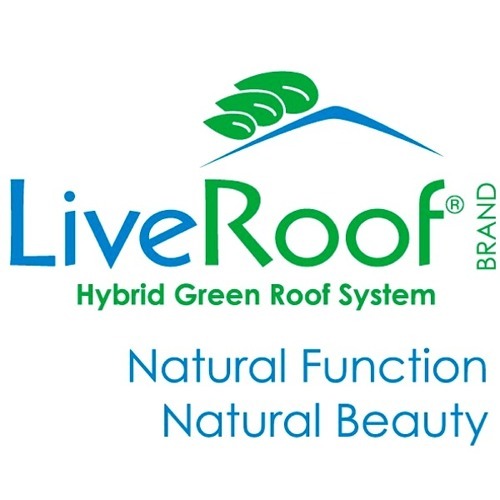 The system was selected because of its strong ability to cater to long-term plant growth, resource efficiency, and reduced maintenance requirements through the use of a unique hydroponic technology utilizing foam as a substitute for soil. 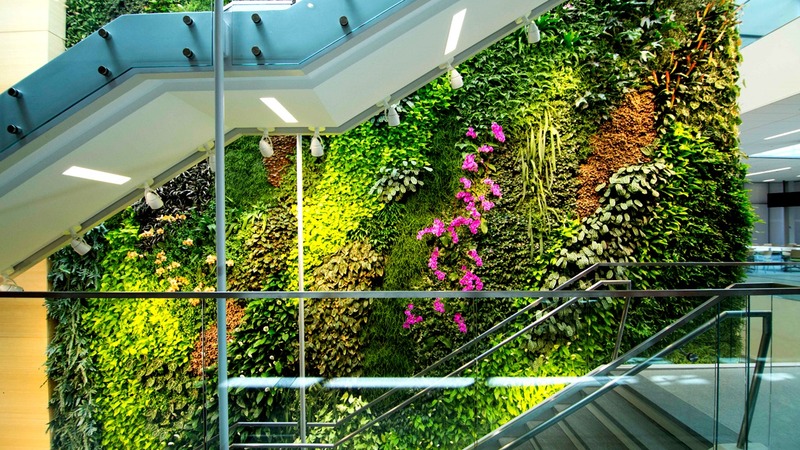 Creating a sustainable and successful living wall comes with a number of inherent challenges. Lighting and irrigation requirements always weigh heavily into the design. Interior spaces often don’t have enough ambient light to support plant material and the presence of the staircase further reduced the light levels in the space. 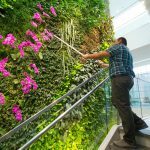 Water is a necessity for all living walls and the installation’s scale created challenges for its effective delivery and collection. EcoWalls, LLC was responsible for drafting all supporting construction drawings, conducting a feasibility study, and coordinating the design, installation and maintenance of this project. This collaborative approach presented many creative solutions to the site challenges described above. A comprehensive site inventory and analysis provided insight into the selection of site-specific plant material. A full daylight analysis was conducted which strongly influenced the supplemental lighting design, using the staircase which once hindered natural light, as an anchoring point for the fixtures. The IFNH Living Wall was also designed as a 100% water efficient landscape, reclaiming, treating, and reusing all excess irrigation water. Finally, a comprehensive maintenance strategy was addressed which would ensure the vertical landscape was properly maintained after the project was complete. Plantings in the Institute for Food Nutrition and Health Living Wall sport eight types of ferns, including Rosy Maidenhair, Lemon Button and Bird’s Nest, and five types of orchids, including Pansy, Mango Moth, Purple Moth and Sharry Baby. The remaining foliage is composed of more than 40 offerings, including Pink Nerve plant, Drunkards Beard, Velvet Philodendron, Watermelon Begonia Vine, Dwarf Snake plant, White Arrow plant, Goldfish plant, Peacock plant, Creeping Fig, Tiger Lipstick, Flaming Sword Bromeliad, and lilies, including Golden Peace, Mini Peace, and Peace. 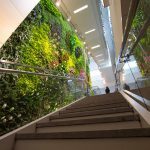 EcoWalls worked closely with Rutgers (the Client), Ballinger (the Architectural Firm), and Parker Plants to collaborate the design, installation, and long-term maintenance of the IFNH Living Wall. 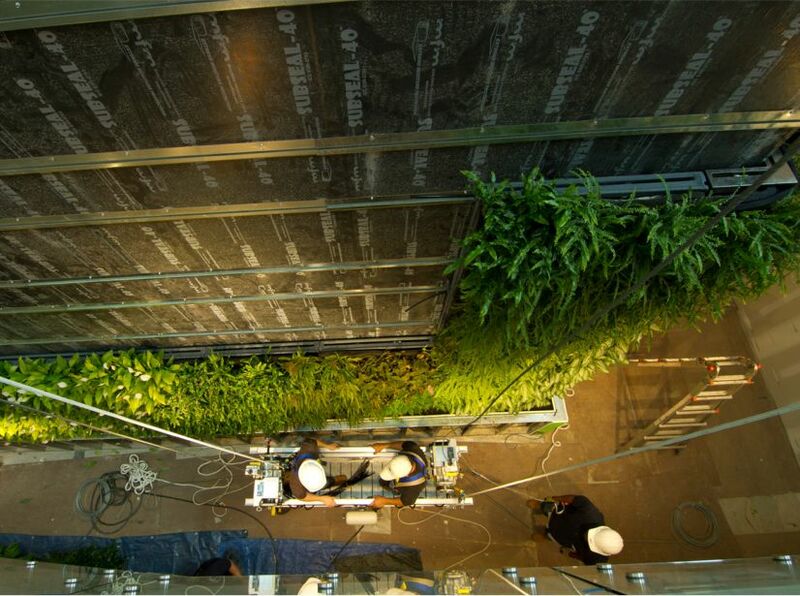 Each EcoWall module was pre-grown at the EcoWalls greenhouse for about 8 weeks prior to site construction with Parker Plants. 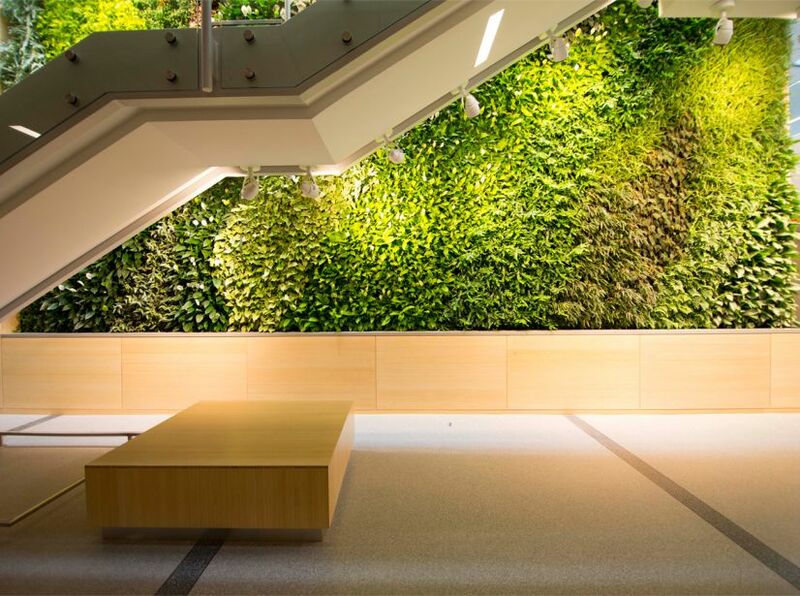 This offered Rutgers a turn-key solution with an established and acclimated living wall with a diverse plant pallet. 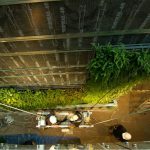 The project was video documented from concept through completion and is used as research and a teaching tool with Rutgers Landscape Architecture, Horticultural Therapy, Plant Biology, and various other disciplines.